These “rice” crispy treats aren’t made with rice at all, but they still bring you back to the memories of the real thing! They’re grain free, gluten free, paleo and even AIP compliant. 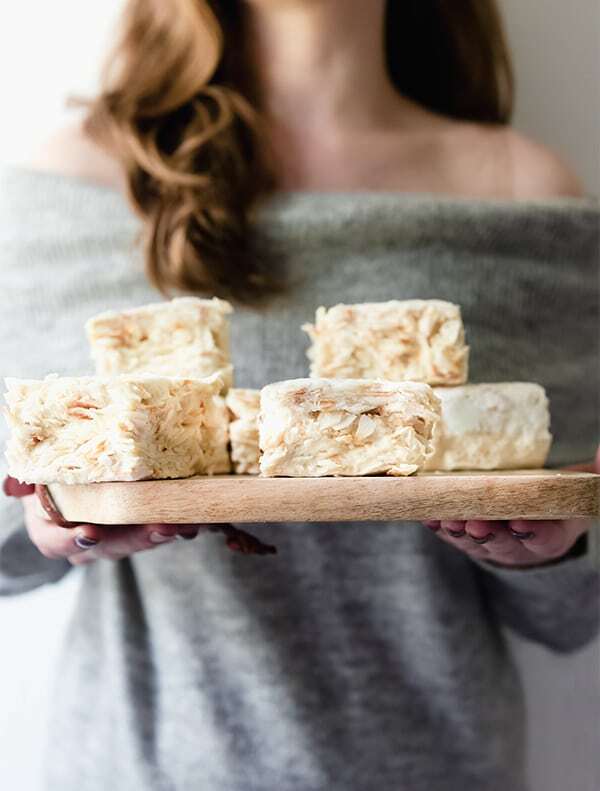 When I asked some of my readers on Instagram what they’d like to see for the Halloween season, rice crispy treats kept coming up. And for good reason. Let’s be honest… those things are delicious! My mom would often buy boxes of rice crispy treats to keep at home, and it was the ultimate treat. I loved how sweet, crispy, and fun these little bars were. But the question was, how the heck do you make this paleo or AIP? 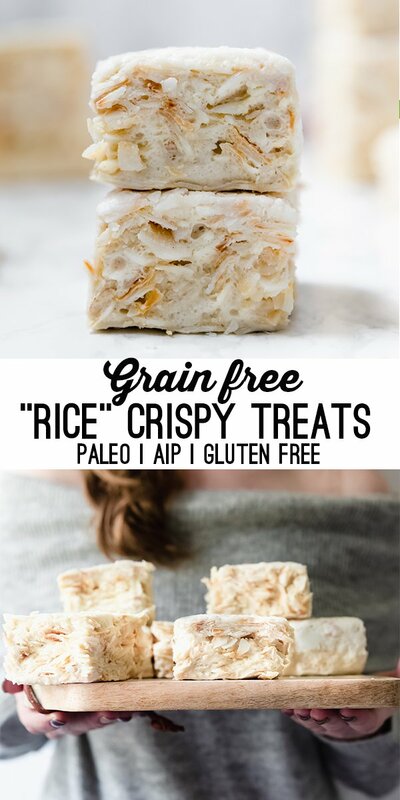 I didn’t know, but I knew I had to try until I finally came up with these paleo and AIP “rice” crispy treats! So, no there’s no actual rice in these little dessert bars. 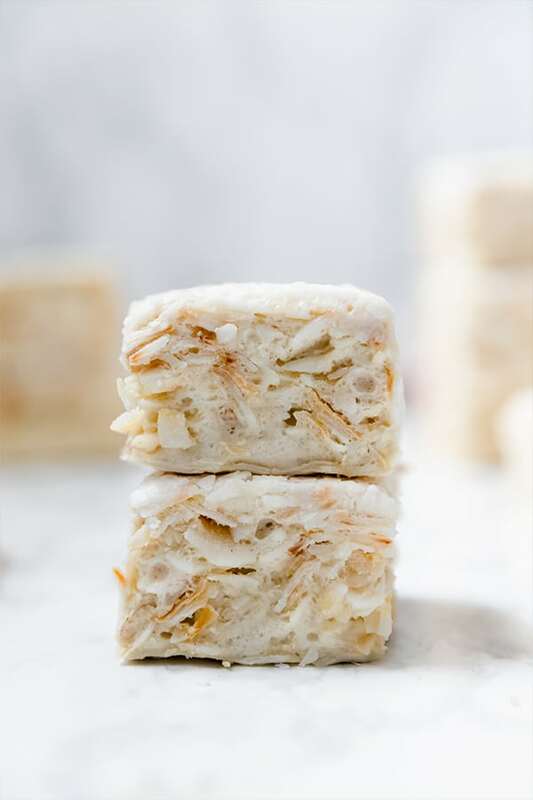 It’s made with toasted coconut flakes and marshmallow. Essentially, these are just big fluffy marshmallows filled with toasted coconut. Call them what you want, but for our purposes, these are as close are rice crispy treats are you’re gonna get! Technically, you could use a coconut based cereal if you’re feeling fancy. However, my goal with my recipes to use accessible ingredients rather than send everyone on a wild goose chase to find the perfect cereal. But if you have a cereal you’d rather use, go for it! As long as the measurements match, it should work. Also, I know that not everyone eats coconut and the question may arise as to whether or not these could be made coconut free. The answer is that I have not found a coconut free way to replicate this. I’m always open to hearing other ideas, but I have not tested another way that I can recommend. This is the rice substitute for these “rice” crispy treats. You can buy pre-toasted coconut flakes like this or simply toast your own in the oven like this. Honey is the main ingredient for marshmallows. You can technically use maple syrup as well, but the color will be different. Gelatin is one of the key ingredients that hold the marshmallows together. I use Vital Proteins. You cannot sub collagen for this recipe. This helps to keep the marshmallow from sticking to the pan. These have a ton of flavor on their own, but you can add some flair by adding vanilla, cinnamon, or even a pumpkin spice blend! 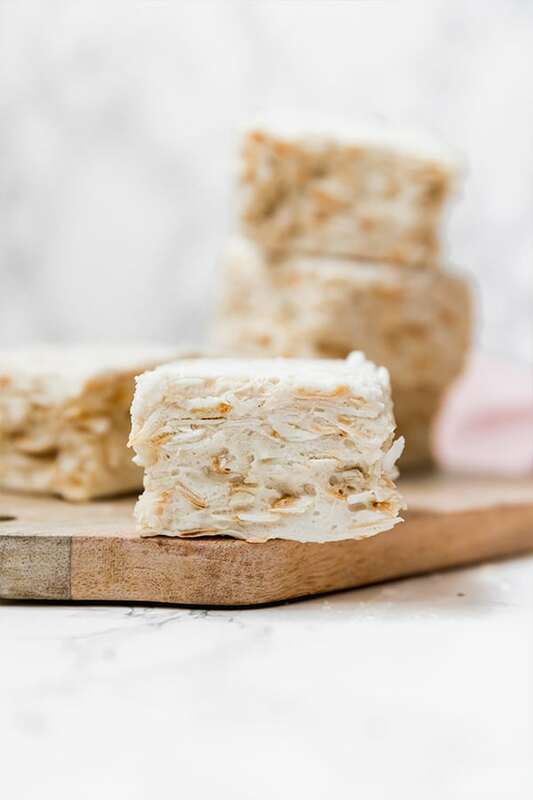 These grain free rice crispy treats are close to the real thing! Prepare an 8×8″ (or slightly larger) baking pan by lining with parchment paper and coating generously in coconut oil. Set aside. Pour 1/2 cup of water into a small bowl and sprinkle the gelatin over top. Stir gently to ensure the gelatin is combined. Set aside. Using a medium-sized pot slowly heat the honey combined with the other 1/2 cup of water. Slowly bring the temperature to 235-240 F degrees on low heat. Remove from heat immediately once the mixture comes to temperature. Begin whisking the honey mixture either with an electric hand mixer or in a stand mixer. Slowly add in the gelatin mixture and keep whisking for 10-12 minutes. The marshmallow mixture should be lukewarm, thick, and marshmallow peaks should start to form. Stir in the toasted coconut flakes and mix until thoroughly combined. Pour the mixture into the prepared pan and place in the fridge to harden for at least 4 hours. After the marshmallow solidifies, carefully remove from the pan and place on a cutting board. 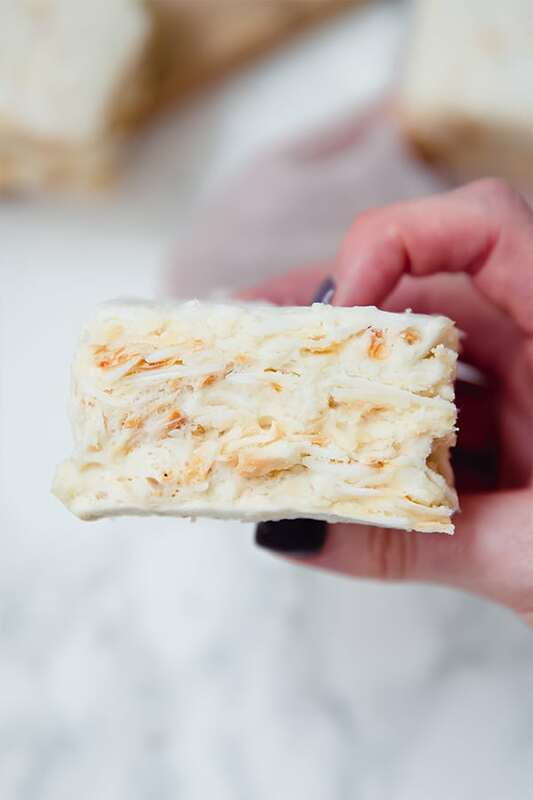 Generously grease a sharp knife with coconut oil and slice the treats in 9 bars. The bars will be hard to slice, so add more coconut oil as needed, and use a slow sawing motion with the knife. Note that the bars will be soft (like a marshmallow) and the “crispy” element comes from the toasted coconut. Which vital proteins do you use for this recipe? What! You’re a genius. Thanks so much can’t wait to try these! I made these but thinking I didn’t put enough coconut flakes, because they can out spongy. Are yours like that or did they come out crisp. How much sugar is their per serving? A whole cup of honey is a lot of sugar.. These are delicious! Excellent directions and very easy to make. Thank you for sharing!!! Thank you so much, Lauren!! So happy you liked it!! Michelle can you use maple syrup instead of Honey? Do you think you could sub maple syrup instead of honey? You likely can… the base of this recipe is really just a marshmallow recipe, so I would look up how to make marshmallows with maple syrup just to make sure the ratios are right ???? Can I substitute something for the vital proteins? Marshmallows need gelatin for texture or they won’t really work at all. There are other ingredients that you can use to make vegan marshmallows, but gelatin is needed if you’re going to keep it AIP compliant.